Looking for a little something to give family and friends this Holiday Season? 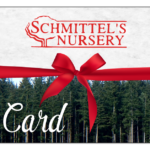 Schmittel’s Giftcards make the perfect stocking stuffer! Pick one up today! We will be closed Easter Sunday. We may close early due to inclement weather.